other cost categories such as interest payments to providers of finance (interest paid) and tax to the state (tax paid). 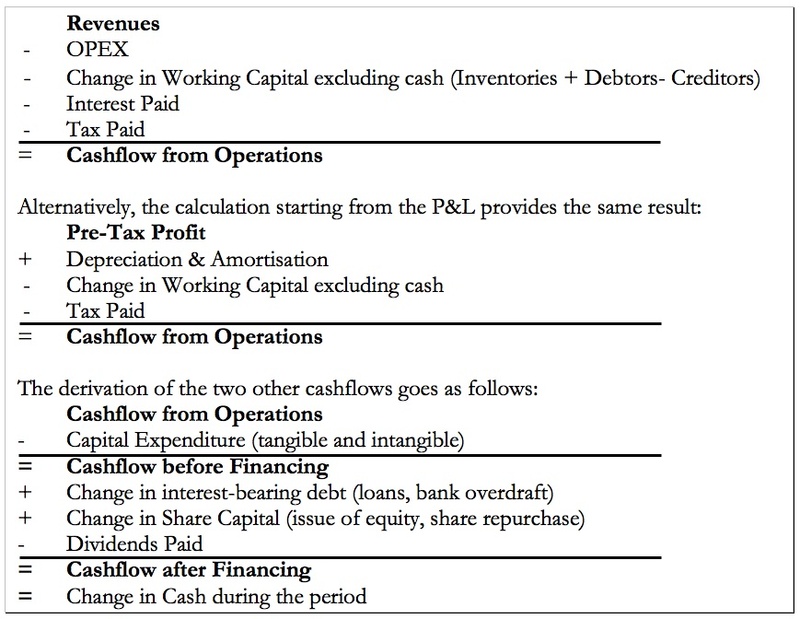 The difference between “cash in” and “cash out” forms the cashflow before financing, also called “capital requirement”, and is either a cash surplus or a cash deficit. A positive capital requirement can be used to pay dividends to shareholders or reimburse debt, and the remainder increases the cash position of the business. A negative capital requirement needs to be covered by raising additional debt or equity capital. The beauty of cashflow is that cash is “real money” and independent of accounting standards. We will also see that the value created by a business is ultimately related to its ability to generate a surplus of cash in the medium to long term, that exceeds the cash invested in the early phase. whether an established business is generating or consuming cash. In the maturity phase, the business will be expected to be cash-flow positive and self-financing. A negative cashflow is not necessarily bad news as it might relate to an investment in a major growth opportunity for the business. Note that the capital requirement can be quite volatile from one year to the next, in particular due to the lumpiness of the large capital investments that are sometimes required. Therefore, it is neither easy nor possible to derive, from historical cashflow statements, whether the business is running in a profitable manner and has enough short-term liquidity. For that purpose, we need the Profit and Loss account and the Balance Sheet.